THE SOUTHERN TEXTILE Group is an established Industrial Group from Coimbatore and has interests in the field of Textiles for more than 40 years. The Flag Ship of this group is THE SOUTHERN TEXTILE LIMITED.The Group’s other Company is Cardwell Spinning Mills Ltd. The total aggregate spindle capacity of this group is 42000 with an investment of over Rs.50 Crores and is spinning various Counts of 100% Cotton, Polyester/Cotton & Polyester/Viscose Blended yarn to support Textile Industries all over India. The Promoter of the Group is the Late Sri.R.Narayanaswamy, who had rich experience and expertise in Spinning Industry. He was originally an employee of a leading Spinning Mill in Dindigul, as Factory Manager for 40 years. We are really very proud of our Promoter who raised from an ordinarily Factory Manager to the level of a visionary by taking over several sick textile Mills and making them as individual Profit Centers. In 1972 he took over the management of M/s. Rajaratna Mills, Palani, Madurai District, a Spinning Mill running Red, on long lease for 10 years. This Mill was about to be nationalized due to its prolonged financial illness. Under the able administration and management of our Promoter, the Mill turned out to be a Profit making Unit. Our Promoter Sri.R.Narayanaswamy took over another sick Mill – THE SOUTHERN TEXTILE LIMITED during the year 1975. He invested all his skills and expertise in this Mill. With his dedicated efforts, working performance of this Mill improved drastically and this has given a lot of encouragement to our Promoter for his subsequent ventures. The other noteworthy event in the carrier of our Promoter is the take over Cardwell Spinning Mills Ltd. This Mill was originally dealing in waste cotton and the credit of changing this waste cotton Mill into a regular Spinning Mill goes only to our Promoter. The fact remains that by versatility, wherever our Promoter went, what ever he touched turned to be gold trash. Sri S N Varadarajan, the only son of our beloved Promoter started his participation in the Management of the Company affairs in 1976 to assist his father. In the process, to his credit, he gained vast experience in the Spinning Industry. He proved to be an expert in the area of selecting good quality cotton, labor management and also in production. In the course of time, both the Spinning Mills under this Group were totally working under his direct control. Mr S.N.Varadarajan, inherited the business enterprises after the demise of his illustrious father Sri R.Narayanasamy in the capacity of Managing Director in association with his wife Smt.Shyamala who is also from a well known Coimbatore based Industrial Group in the capacity of Director. We are a reputed and well established 60 years Spinning Mills in Coimbatore. We have in our roll 450 skilled workers, 30 highly qualified technical staffers who are governed by another 30 motivated Managerial staff members in The Southern Textile Ltd. In Cardwell Spinning Mills Ltd., we have 250 skilled workers, 15 sound technical staffers and another 5 long experienced Managers. We strongly believe that every worker is an asset for our Company. The Management is greatly elated for having 800 dedicated work force in our Organisation with their happy family members. At present both The Southern Textile Ltd and Cardwell Spinning Mills Ltd are banking with The Federal Bank Ltd, Variety Hall Road Branch, Coimbatore-641 001. They are extending excellent customer service with adequate working capital limits. 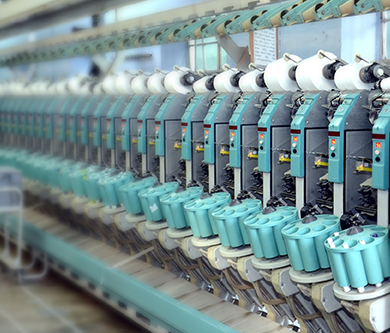 We are spinning high quality value added yarn in our Mills suitable for export market. In the past, we had been exporting container loads of yarn to Spain, Italy and Colombia. We have also exported large quantities of Grey Fabric for suiting & Shirting to Italy continuously for several years. Presently, we are exporting container load of 60s Single PSF Yarn, 2/60s PSF Yarn and also 2/60s PC Yarn of 50:50 Blend to Turkey on Merchant Export basis. We are also looking for export of Rich Silk Sarees & Dress Materials, 100% Cotton Sarees and Dress Materials on Direct Export.